Why call the deli or caterer for game-day bites when these flavourful meatballs are so easy to put together—and make enough to please three dozen fans! Mix first 3 ingredients just until blended; shape into 36 meatballs, each about 1-1/2 inches in diameter. Place in single layer on rimmed baking sheet sprayed with cooking spray. Bake 15 to 18 min. or until done (160ºF). Combine meatballs and barbecue sauce in large saucepan; cook on medium heat 5 min. or until heated through, stirring frequently. Store remaining stuffing mix in airtight container at room temperature. Use to prepare stuffing as directed on package, reducing the water to 1/2 cup and non-hydrogenated margarine to 1 Tbsp. Serve with your favourite cooked meat. For convenience, these tasty appetizer meatballs can be prepped ahead of time. 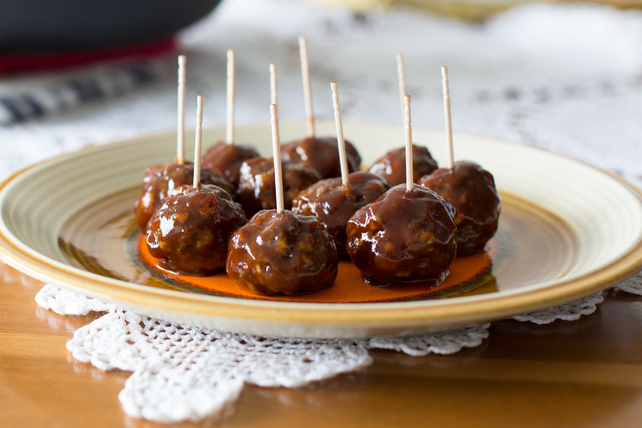 Combine cooked meatballs and barbecue sauce; refrigerate up to 2 days. When ready to serve, cook in saucepan or slow cooker until heated through.